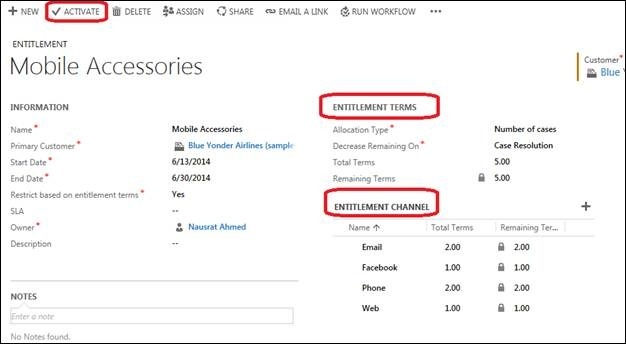 Entitlements is a new concept introduced in CRM 2013 Spring release and it is the same concept of Contracts with advanced capabilities which were not available in Contract and had limitation in the past. It supports Allocation Types of Cases and Hours. You have the entitlement validity dates within which the entitlements are applicable. 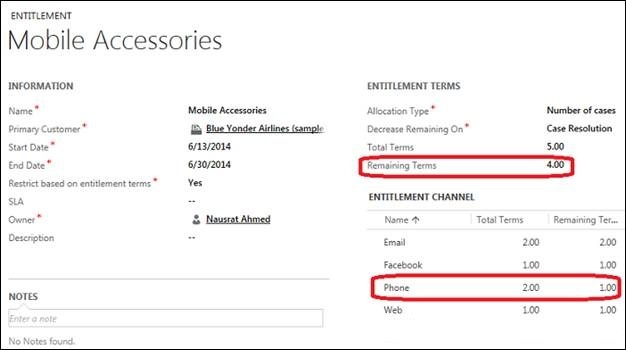 You can now also define Entitlement Channels. 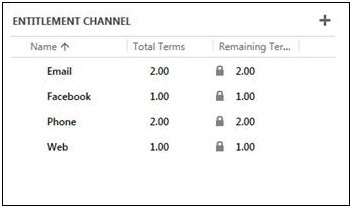 The Entitlement Channel lets you set up the max counts per channel. This means the various channels through which Case can be registered. The moment you create a Case and set the origin to either of these channels, the entitlement count would reduce. This now makes managing Entitlements way simpler than the Contracts. d) Remaining terms: When entitlements are used, this field keeps the count of the remaining services that can be utilized by the customer. The total terms specified in the channels sums up to 6. It allows to add as many channels as needed but it keeps tab on the total terms any account/contact is entitled to when it comes to validating. On clicking ‘Activate’, the entitlement will be activated for the account and/or contact to which it is subjected. Let us now create a new case viz. ‘Mobile battery replacement’. Let the customer name be Blue Yonder Airlines. Click ‘Save’. Once the new case created is saved, the right side of the form will show the entitlements Blue Yonder Airlines is entitled to. The remaining terms and the status of the related entitlement will also be displayed. Let us consider that the ‘Origin’ started from ‘Phone’. So, when the case is resolved, the total number of remaining terms of the entitlement in the case page will be decreased by 1. Thus, for every case resolution (as setup here), the entitlement terms will keep on decreasing along with the channel. Suppose the Entitlement channel ‘Facebook’ has no terms remaining and if still the user RESOLVES a case having this channel, then it will not allow and below message will pop up. Same error will pop up if the total number of remaining terms of entitlement terms is zero. Similarly if any case is RESOLVED with a channel which has not been defined for terms then similar message comes up. Like in this example, we have not selected Twitter in the entitlement channel and resolving a case with twitter is not allowed. If any case related to the entitlement is reactivated, the remaining terms increments in the same way as it decrements on resolving. From above example if case ‘Mobile Battery Replacement’ is reactivated again then the total terms are back to 5. 1) The remaining terms on individual channel solely depends on the case resolution count of that origin irrespective of the total terms allotted to that particular channel. So, even if my total terms are 0 for channel Phone and a case with origin phone is resolved, the remaining terms of phone will be -1. The total terms at entitlement level behaves correctly and would limit till the total terms allowed. 2) If you re-activate a case of origin phone to origin email, then phone remaining terms increments but the email remaining terms stay as it is. 3) Say, you have a case with channel Facebook, but the entitlement does not have Facebook defined in it. Later if Facebook channel is added then it does not take into account the already resolved Facebook case. Whereas when the Facebook case is re-activated then the remaining terms increments. 4) If a case without any origin is resolved then the total terms at entitlement level is taken care of, but the channels would not reflect anything. This clearly means the entitlement channel remaining terms and the total entitlement remaining terms do not necessarily match. 5) May be the behavior and user experience gets improved in future release updates as far as entitlement channels are concerned.